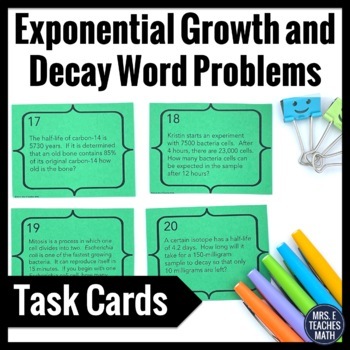 In this set of task cards, students will solve problems using exponential growth and decay. Students will need to be able to write equations to solve the problems. The problems are of various difficulty. Problems with money half-life are included. Make sure these problems are appropriate for your students - download the preview and look at the thumbnails to see problem examples. 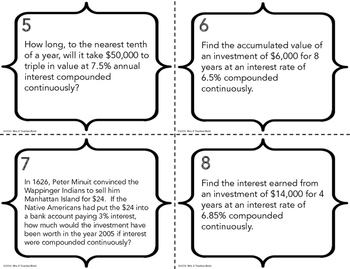 This set includes 24 task cards and the solutions. The cards are given in two different ways: with QR codes and without QR codes. 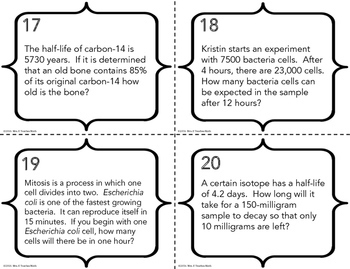 Task cards are a great way to help students review or to use as warm-ups throughout the unit. 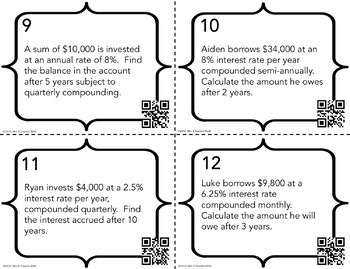 QR codes are a great way to integrate technology in your classroom and keep students interested. Instructions and ideas for use are included.